A holiday party...and we needed to bring an appetizer. I wanted something easy and a bit festive. 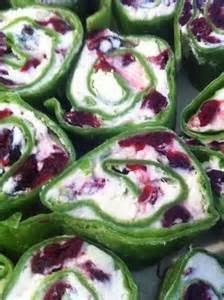 I began looking at my Yummy board and found an old picture I had tagged of Cranberry Feta Wraps...don't they look yummy? 1. Combine first four ingredients and mix well. 2. Divide and spread mixture evenly among wraps. 3. Roll up tightly, wrap in plastic and refrigerate for a minimum of two (2) hours. 4. Slice into 1-2 inch pieces and serve. Add a thin layer of ham to wraps before rolling. Add a cup of chicken to cranberry mixture.